I write to apologise for the error in the subtitling of the Te Tepu programme that you viewed this week which discussed education issues. The translation that you have raised on your blog should have read - “One of the main problems is that teachers do not relate to Maori children.” – Instead of teachers don’t like Maori children. Not only was the translation incorrect, the context of what was said was not translated as the two women were talking about the mainstream education system that Maori children experienced historically and there are many examples of how Maori were strapped and disciplined in other ways for speaking Maori. However as the Executive Producer of this programme I do convey my apologies for any offence this subtitling error caused. In addition to the blog post I was on the NewstalkZB Face Off panel on Friday morning. At the close of the discussion each panellist has an opportunity to offer a bouquet and brickbat. I gave a bouquet to Maori TV for the high quality of their programming but a brickbat for the comment. I will also make sure the explanation reaches that audience next week. I need to act on my irregular resolutions to learn to speak te reo. Serving jail time for similar past offences had not stopped her offending, [Judge James Weir] said. She will have to serve at least six months in jail, and will have special conditions to help her with her alcohol problem when she is released. But in another report we learn that alcohol treatment agencies are swamped and cannot cope with the numbers needing help. There is every chance Brown is a lost case. The community cannot control her so best stay out of her way as much as possible. BUT there is one thing that should be done. She should be offered a tubal ligation operation while in custody. If necessary a system of cash incentives should be instituted for compliance. If not an operation, a reward for using long acting contraceptive injections. Not just for Ms Brown. But for any other female who is not physically safe to carry or raise a child. They have been responding to the cash incentive to produce children - for years in some cases. Time to try a different way of harnessing that response. From time to time I watch Maori Television. The quality is often above anything else on offer. People have serious and extended discussions about matters, something that has disappeared from other channels. Last night I watched a conversation about education, kura kaupapa, children's needs, the lack of fathers, furthering Maoritanga, etc. The discussion featured two Maori teachers (who may have been principals) from Maori immersion schools. The subtitles are good though I sometimes wonder how closely they represent what is said given the Maori language is comparatively constrained in terms of expressing complex or subtle concepts. Towards the end of the programme the interviewer made a statement to the effect that the large majority, eighty percent I think he said, of Maori children were still in the mainstream system and asked about the implications of that. The first respondent said that their spirit wasn't attended to in the Pakeha system, language and culture being a big part of spirit. Fair enough I thought. Then the second respondent said, more or less, some would be OK, but that Pakeha teachers don't like Maori children. Aye, the other nodded. It was there in the subtitles. Pakeha teachers don't like Maori children. I expect this would have come as a terrific surprise and been very hurtful to many Pakeha teachers. What did she base this statement on? Was it a generalisation or a statement of fact, in her mind? And is this the view these two ladies take to their own teaching and propagate to their students? My strongest reaction was to the racism it revealed. But I forget Maori cannot by definition be racist because they are the oppressed people. Only oppressors can be racist. It was a sad end to an otherwise instructive and enlightening programme. When I had just turned 16, school cert sat, studying over, summer break stretching ahead, my friend and I decided to head off down the South Island with her older sister and boyfriend in their ancient Austin A40, back to their even more ancient settler's cottage, complete with coal range and outside long drop, located in Riverton, not far from Invercargill. We had a wonderful summer but it had to end ... with no lift back on offer. So we caught the Southerner from Invercargill to Christchurch intending to the ferry the rest of the way. Unfortunately we arrived in Christchurch late in the day but the ferry didn't sail until early in the morning. No problem we thought. We will just bunk down in the Christchurch railway station waiting room. So there we were. Two young, naive teenage girls; one European and one Polynesian; one with a guitar and one without. "Oi," came a loud voice, shattering our security. "You can't stay here. I'm locking this place up." Uh oh. Nowhere to go, not enough cash to pay for anywhere to stay even if we had any idea how to get there. A railway guard, in cap and uniform, a diminutive, nondescript sort, witnessed our confusion and probably a bit of fear I imagine. "You can come home with me. I'll just ring the wife." Blessed relief. Not a negative thought or suspicion did occur. So off we went in his humble little car, to his humble little railway home. Being very middle class I can see that his possessions and demeanour were ... very humble. The house was spartan but as clean as an operating theatre. His mousey, taciturn wife, with child on hip, showed us a bedroom with twin beds, candlewick covers, bedside drawer with lace doily between. I think we more or less collapsed with exhaustion. In the morning she made us mince on toast to set us right for the next part of our journey. Neither of us had ever had mince on toast for breakfast before. And Mr Railway Guard drove us to Lyttleton before going on to work. I hope we adequately expressed our gratitude to these exceptional people. Why the hell did I wake up thinking about this? I miss the past and I miss my friend (although I can e-mail her in Australia and reminisce.) No. I believe something I was reading about Victorian attitudes to the poor based around deserving and non-deserving cases triggered my memory of such obviously 'poor' people, living in almost Victorian austerity, who would have, if they needed help, been deemed eminently deserving. People who, in turn, would share what little they had. But what I am left pondering is whether the same thing would happen today? Are there people that would care and trust enough to bring two complete strangers into their home? But more so, should two 16 year-olds get into a car with an unknown man on the promise of a bed for the night? New Zealand is not the place it was in the sixties and seventies. I read a lot of debate about violence and whether or not it is worsening but it is usually in the context of those debater's experience - the last twenty years. Their memories do not extend to those safer times. I am not going to finish by expressing a desire to turn back the clock. There is much that we would not want to return to. But I do fervently wish we could go forward to safer times. I see absolutely no sign that would give cause for optimism though. "Human beings" and "human becomings"
Warning; If you are a parent the following could make you very angry. A research project analysed a sample of the submissions to Parliament in 2006 on the Bill to repeal section 59 of the Crimes Act 1961. S.59 had provided a defence to parents accused of assaulting their children, the defence being that they used force for the purpose of correction. The project examined two particular contrasting social viewpoints of children -- children as "human beings" and as "human becomings" -- and whether these two viewpoints were implicated in people's views on the use of physical punishment. The research hypothesis was that people who advocate the use of physical punishment are more likely to conceptualise childhood as a phase of development, where the child is on his/her way to becoming an adult, unable to reason and in need of constant guidance from adults; in other words, that children are human becomings. Alongside this, we hypothesised that people who see childhood as a complete state in its own right, and see children as fully developed at whichever age and stage they are in, having full human rights and contributing to society -- the human beings view -- are more likely to reject physical punishment. We found that submitters expressing a view of children as human beings were more likely to oppose physical punishment and support repeal, whereas people who saw children as human becomings favoured physical punishment and opposed the Bill. I take exception to this concept for starters. It leaves no room for another view which is that children are becoming adults and are at varying stages of development. That I do not see a child as an adult does not mean I do not see it as a human being - that is a preposterous idea. Most people cherish their children. The idea that people who opposed the repeal of section 59 do not view children as human beings is pretty offensive to be honest. The different ways of viewing children have implications for how children should be raised and what sorts of rights children should have within society. In the developing adult view of childhood, where children are seen as on the road to adulthood, their status as children now is less important than what they will become in the future. Viewing children as social actors and childhood as a structural form has implications for the roles and relationships of parents and children. Here, adults are no longer seen as all-knowing and all-powerful, and children are no longer viewed as incompetent, ignorant and unable or unwilling to reason, or in need of constant adult guidance in their development towards becoming complete human adults. It gets worse. Because I see my child as "on the road to adulthood" it follows that I also see her as "incompetent, ignorant and unable or unwilling to reason." In fact I see her as none of those. Quite the opposite. If anything the labels are more fitting to adults I have experienced. We developed a hypothesis which we would test by examining the submissions using Qvortup's (1994) summary terms as a framework. Our research hypothesis was that people who advocate the use of physical punishment are likely to conceptualise childhood as a phase of development, where the child is on his/her way to becoming an adult; in other words, children are "human becomings". The logic of this view is that since children are less than adult, not yet competent and reasonable human beings, or even in some cases, sinful, then adults can assume a right and a duty not only to guide but also to chastise if necessary, as the child is unable to be reasoned with and is in need of correction. We also hypothesised that, on the other hand, people who see childhood as a complete state in its own right are more likely to reject physical punishment. In this view children's competencies are valued and children are viewed as able to understand others' perspectives and to respond in sensitive and reasoned ways to others, according to their abilities. A children's rights perspective fits within this view, since here children are perceived as full and complete "human beings", who therefore command the same human rights as any other people. Of course children always need care and nurturance appropriate to their development. Are you starting to form an impression that the researchers are slightly biased? One of the reasons I never had my children christened (their father has a faith) is the ceremonial utterance that children are born into sin. I can't pretend to really understand what theologians mean by it but the words are unpleasant and I want no part of it. Now because I see children as "less than adult" (and sometimes more than adult) I am associated with a view that sees children as "sinful". Further, there is no discussion of nuances. No consideration of how a two year-old might differ from a 12 year-old and how their parent's regard for their faculties and handling of them will change over time. Although submitters clearly either supported or opposed the Bill, most did not comment on the nature of children. Thirteen wrote that children are bad, wilful, and sinful; six submitters thought that children were good and intelligent. For nine submitters children did not have cognitive ability and could not be reasoned with, whereas 13 submitters thought that children had cognitive ability and could be reasoned with. ....for those 91 submissions indicating views of children as either human becomings or human beings, the results support our hypothesis. Those people who saw children as human becomings were more likely to oppose the Bill and support physical punishment, and those who saw children as human beings were more likely to support the Bill and oppose physical punishment. Well of course the results will support their hypothesis. They have borrowed a faulty concept and overlaid it according to their rules. Next they can extrapolate their 'findings' to anyone who disagrees with a ban on smacking. We are all vilified by their silly black and white ideas. This post is already too long. But let me leave you with this. These people make a public living out of intellectualising life; the behaviours and relationships of your world, of which they have no knowledge. They arrogantly pigeon-hole views they disagree with or cannot comprehend and then charge you for the privilege of receiving their wisdom. This nonsense really has to stop. Schools are pleased that the NCEA results are being statistically represented in a way that is fairer. Instead of percentages being based on rolls they are now based on participation. In some cases this has made a substantial difference. Nationally, 63 percent of all year 11 pupils jumps to 70 percent. Great. 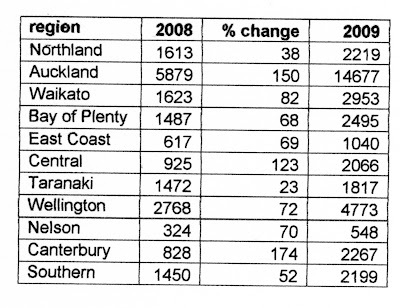 So what is happening to those students enrolled and NOT sitting NCEA? Surely it is important to compare these differences between schools as well. It is one thing for a school to do well in getting pupils successfully through the exams and assessments but whether or not they are motivating students to actually participate in the first place is also a marker of their success. Readers know that I am not a supporter of 'three strikes' but any bill that is before select committee deserves a thorough investigation of its merits and pitfalls. The refusal of Judith Collins to answer David Garrett's question (below) would be less surprising if he was in opposition. But this bill is a combination of her own party's campaign promises as well as ACT's. What gives? One is inclined to suspect that National really doesn't want a bar of it, giving weight to Garrett's earlier claim that they had stymied the bill's chances of passage by changing the list of qualifying offences. There is an adage that goes something like, he who controls the knowledge controls your fate, or in this case, your bill's fate. 3318 (2009). David Garrett to the Minister of Corrections (08 Apr 2009): How many persons currently incarcerated for either murder or manslaughter had, at the time they committed the offence for which they are currently incarcerated, served at least three sentence episodes for any of the following offences: Sexual Violation contrary to section 128 of the Crimes Act 1961; Murder contrary to section 167 or 168 of the Crimes Act; Attempted murder contrary to section ….of the Crimes Act; Manslaughter contrary to section 171 of the Crimes Act; Wounding with intent contrary to section 188 of the Crimes Act; Injuring with intent contrary to section 189 of the Crimes Act; Injuring by an unlawful act contrary to section 190 of the Crimes Act; Aggravated wounding or injury contrary to section 191 of the Crimes Act; Aggravated assault contrary to section 192 of the Crimes Act; Assault with intent to injure contrary to section 193 of the Crimes Act; Assault on a child, or by a male on a female contrary to section 194 of the Crimes Act; Cruelty to a child contrary to section 195 of the Crimes Act; Using any firearm against a law enforcement officer etc. contrary to section 198A of the Crimes Act; Commission of a crime while using a firearm contrary to section 198B of the Crimes Act? Hon Judith Collins (Minister of Corrections) replied: The answer to this question would require significant collation and I do not consider this a good use of the Department of Corrections’ resources. 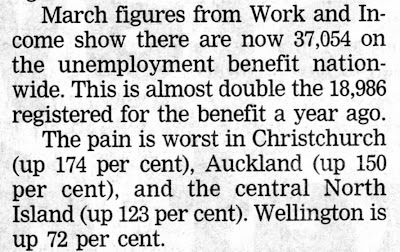 On Thursday the following appeared, again in the DomPost. It may or may not have come from this blog. If it did that's good. If it didn't, apologies for my presumptuousness. Every time I start thinking about what I want to say on my blog today I get a headache. Perhaps it's anger, or frustration, or maybe I shouldn't have mixed two different wines last night. I am trying to listen to Trackside, my escape from the absurdities of the world around us, and this damn advertisement for "Families Day" keeps bloody well intruding. FFS. I do not need the frigging Families Commission telling me that I need to appreciate my family and do stuff with them, especially on Mother's Day. How many goddamn days can we stomach? You see, the United Nations passed a resolution to promote families, especially mothers and children. And so now the waste-of-space Families Commission is using your money to do just that - all week. ...the Families Commission also wants everyone to stop and think about Why Families Matter? - to you, to your community and to all New Zealand society. How does being part of a family help in your life? How do healthy and positive families help your community or New Zealand as a country? And how do we help each other put family first? And male readers, Pansy Wong, National's Minister for Women's Affairs wants you to start pulling your weight around the house. "My vision sees New Zealand as a place where women are recognised for balancing their roles as mothers and workers; a place where unpaid work is shared evenly between men and women". Aren't you sick and tired of being either hen-pecked or ordered to celebrate at every turn? Oh please, please can I have a Get-Off-My-Back-And-Out-Of-My-Face day. And I was going to say something about Greg O'Connor's statement that the Napier shooting is a wake-up call to New Zealanders to stop tolerating the increasing violence in our society. Perhaps the wake-up call is actually to the utter futility of continuing cannabis prohibition. But, bugger it. I better go and take an Ibuprofen or 10 instead. Which reminds me about teenage son Robert who was being theatrically melodramatic about all the time pressures on him to do music practice, homework, travel in and out of the city every day, etc. "I'll kill myself!" he said. "But you don't have time to," I replied. "Oh yeah," he said. And after a few more seconds, "I'm not doing it on my time anyway."